In just a few days many of our readers will be celebrating Рождество (Christmas). As you may know, most Russians do not celebrate Christmas on December 25, but instead do so on January 7 according to Юлианский календарь (Julian calendar). Much like Christmas Day in the US, Christmas Day in Russia is официальный выходной (official holiday). It follows on the heels of the новогодние праздники (New Year holidays) which are also days off and form a mega-holiday that this year lasts from тридцатое декабря (December 30th) to восьмое января (January 8th). While for many this long period of зимние праздники (winter holidays) is the time of revelry and lots of delicious food, верующие (religious) Russians are observing the 40-day fast. It ends on the evening of January 6th, the time known as Сочельник (Christmas Eve). The word сочельник is rather unusual. Unlike the English-language “eve”, сочельник is only used to describe Christmas Eve. Days before any other holidays or events are called канун (eve, night before), although the word канун can also be used for Christmas Eve. Канун Нового года в России является нерабочим днём – The New Year’s Eve is a day off in Russia. Накануне Нового года магазины продают больше всего шампанского – Stores sell the most sparkling wine in the days before the New Year. Perhaps you’ve noticed that the word сочельник sounds close to another Russian word, сочный (juicy). Indeed, the two words share the same root, сок (juice). The day before Christmas is the day of строгого поста (strict fasting) and reflection. Traditionally, the fast lasts до первой звезды (until the first star appears). And the traditional dish served at this point is сочиво also known as кутья, a dish of cooked wheat grains with walnuts, raisins and honey. Hence the word for the Christmas Eve – сочельник, the time when сочиво is eaten. Russia has many beautiful Christmas traditions. Many years ago, one of the most beloved traditions took place в ночь перед Рождеством (on Christmas night). After breaking the 40-day fast with family, people used to stay up all night, walk from house to house and sing колядки (Christmas carols). As a reward, колядующие (those singing колядки) would get generous угощение (refreshments). This tradition возраждается (is resurging). Many of the carolers would disguise themselves by putting on наряды (costumes) and маски (masks) or личины (masks, from the word лицо – face). These ряженые (masks) would, in addition to caroling, play pranks on those who were not very щедрые (generous) with the reward for the singing or costumes. The Christmas night begins a period known as святки (yuletide), a time for святочные гадания (yuletide fortune-telling). Young girls would try гадать (to read fortune) in tea leaves, mirrors, candle wax, barn noises, and such. Most of such fortune-telling had to do with угадать (to guess) what суженый (Mr. Right) would look like, when he would appear in a girl’s life, and whether the married life would be happy one. 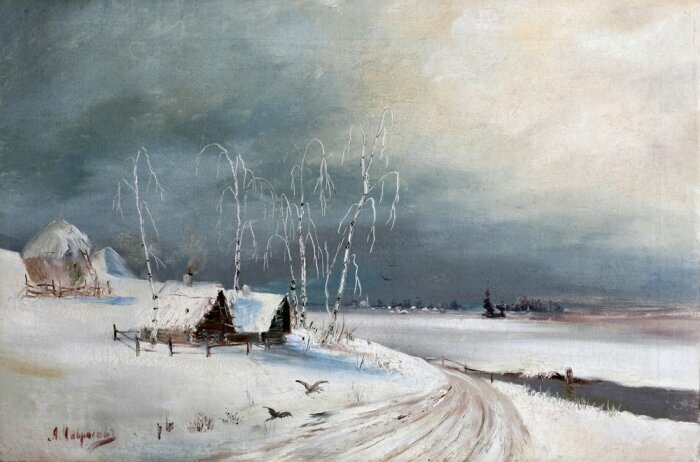 One of the most famous works of Russian classical literature, Pushkin’s “Eugene Onegin” has a scene where the young heroine, Tatiana Larina, tries to foretell her future husband’s name as she walks out to the road in the middle of the night to ask the first passerby for his name (which, according to the belief, would also be the name of her future husband). Many other Russian classical authors wrote stories about or included descriptions of Christmas and its обычаи (customs) in their works. One of the most beloved stories is Gogol’s fairy tale “Ночь перед Рождеством” (Christmas Eve or The Night before Christmas). It starts with the devil stealing the moon, two drunks getting lost in the snowstorm, and a beautiful girl making an unreasonable demand of a courageous and handsome young man who adores her. But it all ends as things should end on Christmas. The good ones are rewarded and even the bad ones are not punished too severely. Yelena, many thanks for another informative and entertaining post! As I write, it is the day of Christmas Eve here in Sydney Australia. Most people are still working; school broke for the Summer holiday last week. It is very hot today as it’s been the past few days – +38C. Fortunately I don’t need to go out into the heat today, I’ve bought all the gifts and they are all wrapped, ready and waiting and I have all the food stuffs I need. We, my husband and I will spend the day tomorrow at our daughter’s house with her husband and our almost 2 year-old grandson. Our 2 sons will come too, the eldest with his wife and our very new granddaughter born on the 11th of this month! It will be a lovely family day. I’m helping my daughter with the food preparation; I’m cooking the pork and making some salads – Olvier and a beetroot, carrot and feta cheese salad. Счастливого Нового года и весёлого Рождества!